Facebook's Mark Zuckerberg has announced the launch of Internet.org in the Philippines, which allows the public to get free internet access. "We're one step closer to connecting the world as we launched Internet.org in the Philippines today. Now everyone in the country can have free access to internet services for health, education, jobs and communication on the Smart network," the social networking site's founder and chief executive officer posted on March 19. Internet.org is "a Facebook-led initiative bringing together technology leaders, nonprofits and local communities to connect the two thirds of the world that doesn’t have internet access." 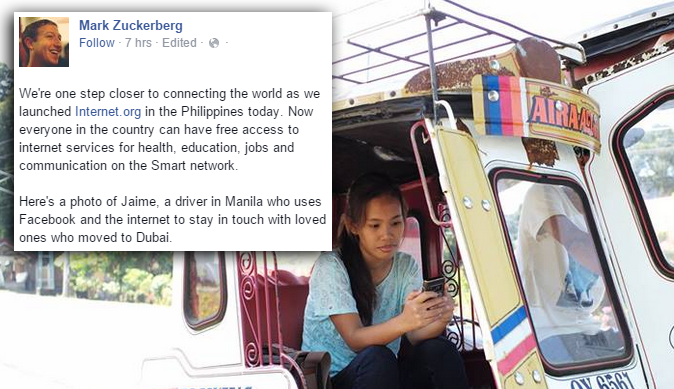 Zuckerberg attached a photo of a tricycle driver named Jaime who, he said, "uses Facebook and the internet to stay in touch with loved ones who moved to Dubai." Prior to Thursday's official announcement, technology news blog Taragis.com posted that the global organization partnered with local telecommunications giant Smart along with Talk 'N Text and Sun Cellular for this, which means only their subscribers can enjoy free internet access. To browse these sites for free, just text INTERNET to 9999 or download the Internet.org app from Google Play. Take note that you have to keep the Internet.org website open in your browser or use the Internet.org app to avoid data charges. It is also important to set your phone notifications to manual.